It doesn't look good, does it. Bob pointed out to a recent article by Rob Honeycutt at SkepticalScience.com, which demonstrated that it's quite likely that this year we'll hit the 1°C barrier. The chart used a baseline of 1850 to 1899, as representing the pre-industrial period. I can't use the actual pre-industrial temperatures for reasons that should be obvious (the global records don't go back that far, except for BEST, and that's iffy for the earliest times). Still, 1850 to 1899 is close enough. 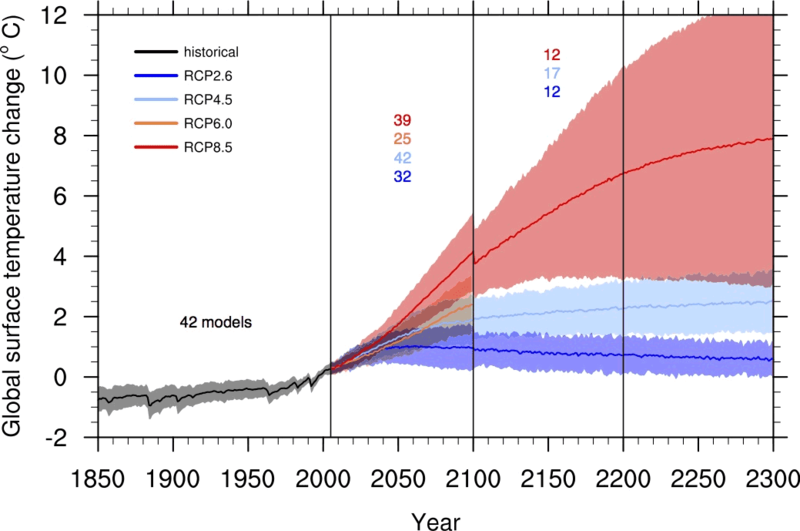 So, even taking a conservatively realistic period - the most recent one, a linear projection gets us to breaking the 2°C barrier in 2080, well before the end of this century. Some (young) HotWhopper readers would still be hale and hearty at that time, if a bit hot. Based on the linear trend of the GISS LOTI reconstruction, global surface temperatures have only risen 0.9 deg C since 1880. See Figure 5. It’ll be a while longer (maybe a decade, based on the linear trend from 1880 to 2014) until we reach the halfway mark of the 2 deg C threshold. Why would he take a linear trend from 1880, you ask? Good question and one for which I have not the faintest idea. It does indicate that he doesn't have the first clue about climate change and how it's the amount of CO2 in the air that determines warming. (Bob's a greenhouse effect denier by the way.) 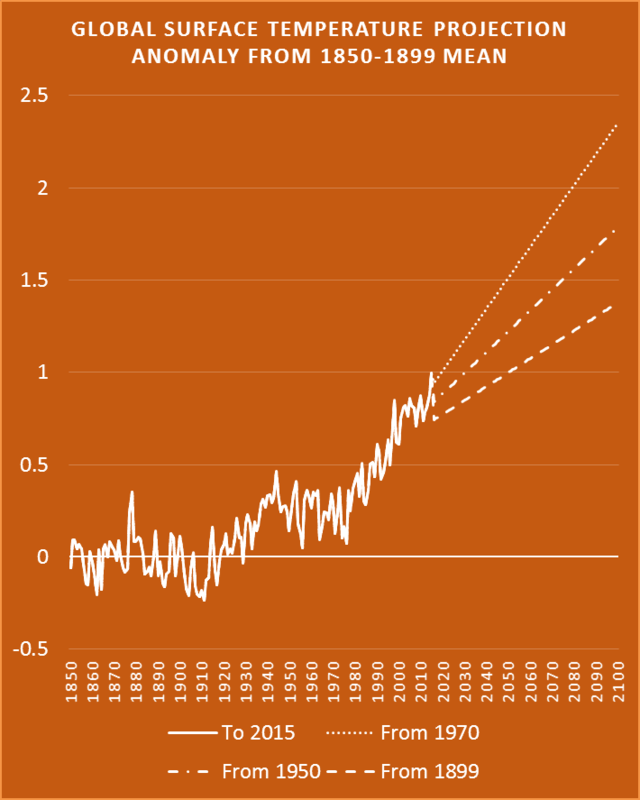 The trend has been increasing as CO2 accumulates. It's now much greater than the trend from 1880. Using pre-industrial times as the bases for anomalies helps to illustrate something very important to persons new to global warming: climate models do a poor job of simulating past global warming. Why then should those newcomers believe the political-agenda-financed climate-model predictions of future global warming that are based on speculations about yet-to-come emissions of greenhouse gases? wickedwenchfan thinks that Venus is cold and has no greenhouse effect! More than 3400 times the pre industrial concentration on Earth yet closer to the sun. No global warming. No greenhouse effect. None. Zero. Nada. Zilch. We used to hear about a “tipping point”. If that temperature were exceeded then non-linear positive feedback would cause the temperature to soar to catastrophic levels. 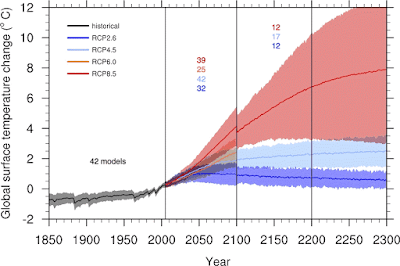 Have the alarmists given up on the tipping point? I am awaiting sound research showing the optimum climate for our present biosphere. But most “research” is really an attempt to secure the optimum level of government intrusion in our lives. It is no surprise that almost every demand made by advocates of global warming converges on bigger government, higher taxes, less freedom and more restrictions on how we choose to live our lives. That tells me all I need to know about this massive fraud. Temperature rise since the late 1800’s is how we know the Little Ice Age ended then. For a little ice age to end there necessarily needs to be warming. That happened – why is this a surprise? Glaciers that advanced during the LIA are now receding. That is happening. Why is *this* a surprise? J needs to look at the last chart up above. Then he might see things differently. He'd not be able to discern his medieval or Roman warm period, compared to where we're heading. August 14, 2015 at 6:17 amI choose the medieval or Roman warm period as my reference period for anomalies. Now things don’t look so bad ! MarkW is one of the self-deluded deniers. A regular at WUWT and a wilful ignorant. There’s still the fact that the so called 2.0C limit was just made up, there never was any basis for it. Regardless, the roman and Minoan warm periods were apparently hellish, because they both broke that limit. To think there are those so utterly, brazenly, and idiotically convinced that Venus is cold, all to bolster their all-consuming cognitive dissonance, about a theory that they are so wrong about, they're not even wrong. Well, in his "defense" he "equates" the Earth situation and the Venus situation by taking the surface of the Earth and "equating" it to the level in Venus' atmosphere which is at 1000 millibars 49.5 km up. That way it all makes "sense". Isn't science all about equating things? 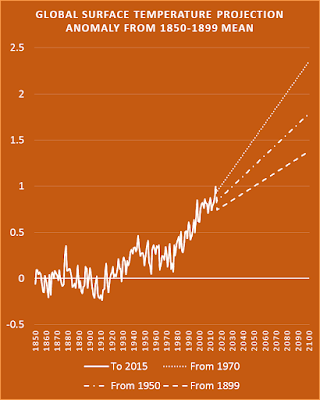 Pointing to the fact, that the 1°C halfway point was reached in more then one century, using a graph showing the imminent 1 °C point to be reached in less than 3 decades from that point, and still babbling about a linear trend is simply priceless. Obviously Tisdale lacks the capacity to reflect whats he's talking about. Tisdale and WUWTians are proof comprehensive that stupid people should not be allowed access to computers or sharp instruments. It matters not that Tisdale, Ball et al make endless spectacles of themselves because to those inside the bubble they will always be the giants of science. Anthony needs a high post turnover rate and his adoring commenters are pathetically undemanding. Never mind the rigour feel the thickness. I wonder if Wickedwenchfan is a student of @SteveSGoddard?